Island Winds East is located less than .10 mile west of Hwy 59S at 333 West Beach Blvd in Gulf Shores, AL. Island Winds East is direct beachfront, built in 1983. It has 8 floors consisting of 87 units of one-bedroom units of 500-600 +/- Sq Ft, two bedroom units of 800-1000+/- Sq Ft and three bedroom units 1200+/- Sq Ft. Units ending in 01 and 10 are the three bed units with a side view of the gulf. 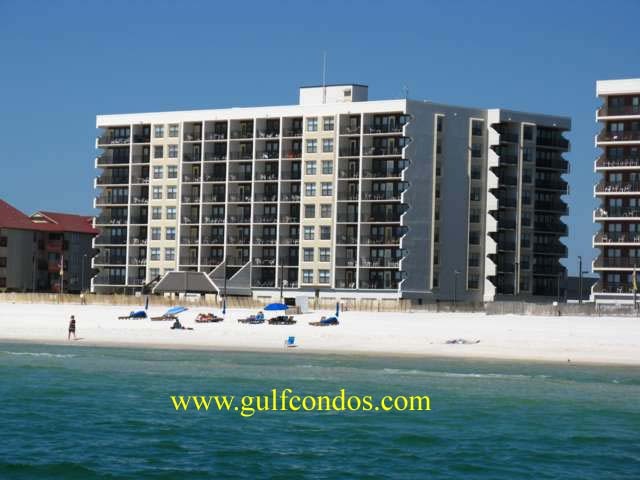 Units ending in 02 and 08 are two bed condos with a side view of the gulf. Condos ending in 03 - 07 are direct beach front. Amenities include: BBQ Area, Exercise Room, Fire Sprinkler System, Outdoor Pool, Private balcony overlooking the Gulf of Mexico.